eeping comfort in mind, the Stamina Air Rower features an oversized and angled seat rail with a sliding, padded and upholstered seat that will allow the user to exercise for extended periods of time without the worry of discomfort. If you plan on using a rowing machine to train for actual water rowing, however, this may not be the machine for you to train with. With its angled seat, this particular machine focuses more on upper body strength, and won’t feel as closely like actual rowing as other rowers like it. The hand grips are textured, giving the user a completely secure and stable grip while they row, and minimizing the possibility of blisters. The large footplates have adjustable nylon foot straps that will accommodate any user. But, the footplates on this machine don’t pivot, and may hinder the natural movement of your feet as you row. This rower has a maximum weight limit of 250 pounds. With its longer seat rail, this particular machine is suitable for users of all sizes, with reports of people 6’4″ using the machine with no issues. The Stamina Air Rower’s sturdy steel frame folds easily and quickly, and rolls smoothly on its built-in wheels, making moving and storing the machine quick and easy. Also, when the machine is folded it reduces its footprint by almost 50%, making it great for people with limited space. Assembled, the machine measures 77 inches long by 18 inches wide by 22 inches tall. The assembly is also extremely easy, with some users reporting that it only took them 15 minutes to put the machine together with the 2 included Allen wrenches and a regular wrench. 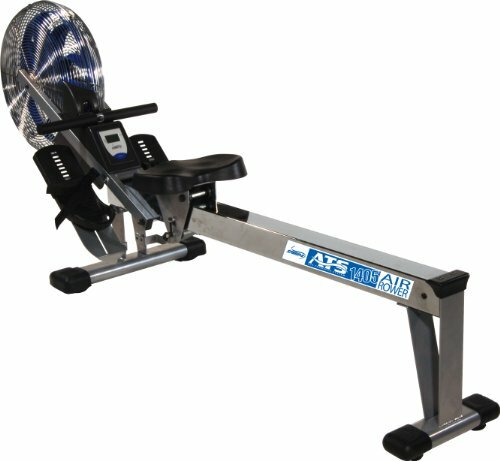 The steel frame of the rower comes with a 3 year warranty, and the parts come with a 90 day warranty.